The State of the American Workplace: Employee Engagement Insights for U.S. Business Leaders report highlights findings from Gallup's ongoing study of the American workplace from 2010 through 2012. This latest report provides insights into what leaders can do to improve employee engagement and performance in their companies. 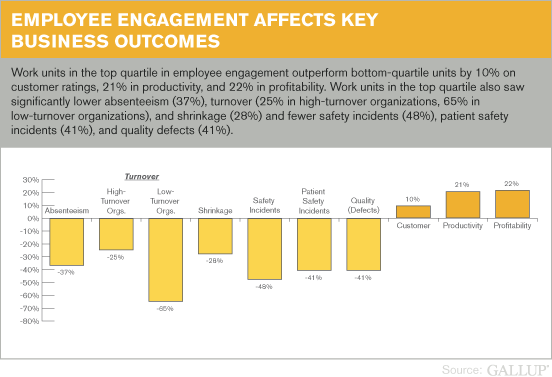 It includes an overview of the trend in U.S. employee engagement, a look at the impact of engagement on organizational and individual performance, information about how companies can accelerate employee engagement, and an examination of engagement across different segments of the U.S. working population.